Students: there are a few travel grants for presenters available. Please FAX the registration chair at +1 303 556 6829 before April 4th your name, a photocopy of your current student ID card, and which paper you will be presenting. Presenters: there will be a laptop with PowerPoint 2000 and Adobe Acrobat reader and a projector available for your presentation. There will also be an overhead projector for transparencies. 802.11b wireless access at the conference will be provided by Sanitas EG. If you have a paper in the conference and need a visa letter, contact: piuri@dti.unimi.it. The program has been finalized. Early registration is due by March 17th, 2004. ACM member price is $500, non-member is $550. Late registration for members is $600, and for non-members is $650. There are two registration forms: a Word for Windows fill-in form (the preferred method), and a PDF form to fill in by hand. Students: contact the registration chair for additional financial considerations. The venue will be the Hotel Continental Terme. Accommodation Reservation form can be found here. How to get to Ischia. Authors are invited to submit papers on all aspects of innovative computing systems. The conference specializes in those technologies on the frontier of computing and that will one day meet the needs of the most demanding applications. Papers are welcome on theory, methods, technologies, and implementations concerned with innovations in computing paradigms, computational models, architectural paradigms, computer architectures, development environments, compilers, and operating environments. Papers with new ideas and perspectives on computing are more than welcome. The conference is planned for April 14, 15, 16, 2004 on the island of Ischia Italy. Due date for the draft papers is November 24, 2003. 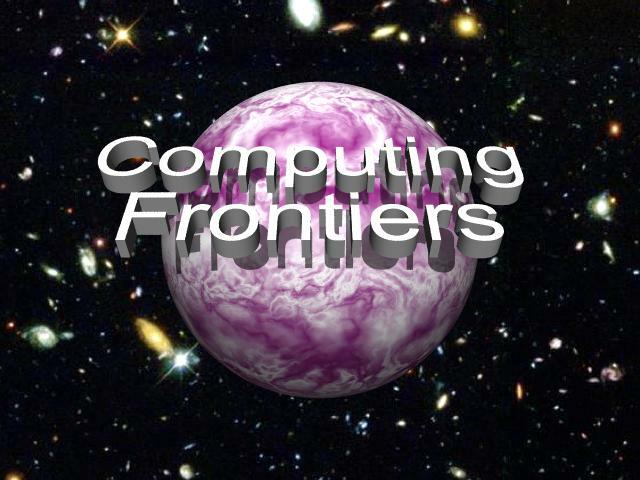 Computing Frontiers is based on the Massively Parallel Computer Systems conferences and is sponsored by ACM SIGMicro. The call for papers is available as a Microsoft Word document, an Adobe pdf file, and a plain text file. If you have any questions, please contact beatys@mscd.edu.